The new central city is compact, people and cycle friendly and buzzing with activity. Come in and take a look. Read this month's newsletter and subscribe for more central city updates. We're working on transport projects to make it easier, safer, more efficient and enjoyable to get around. Walk, take the bike, bus or use our car park buildings. Read more and track the status of these projects by visiting Have your say(external link). Our roads, footpaths and cycleways are greener with more trees and plantings. More travel options for people whether by car, public transport, cycle or walking means improved traffic flow. Some routes are best suited for people and cyclists, which makes it easier for cars and buses to get where they need to go. Our central city has laneways and pocket parks to explore by foot or by bike. Wide footpaths mean more space for things like seating and entertainment. We’re embracing new ways of sharing the streets and public spaces – this means investment in cycleways, public transport, and spaces for people and cars. The central city’s four avenues are perfect for travelling around the city – meaning less congestion in our city’s core. A better system of one-way streets and some changes to two-way helps you get around the city more efficiently. Plenty of handy off-street car parking means our streets can have wider footpaths, trees and cycleways. The priority for on-street parking is mobility spaces, loading zones and short stay. Well-connected walking, cycling and public transport facilities and routes. We’re building a central city travel network that meets the current and future needs of inner-city travellers – whether you travel by bus, car, cycle or on foot. The challenge is to fit it all in, within the existing road space, and make it safe and enjoyable. This takes lots of planning, lateral thinking and collaboration – here’s how we do this. Once a transport project has been identified, we get together with traffic engineers, urban designers, landscape architects, arborists and other professionals to work-up a scheme design. We check in early with directly affected businesses and property owners, and residents. We also talk to other key stakeholders, such as emergency services and the disability sector. The proposal is then assessed by independent safety auditors and peer reviewed. The scheme design is normally discussed with the Waikura / Linwood-Central-Heathcote Community Board before being presented to councillors on the Infrastructure, Transport and Environment (IT&E) Committee, prior to consultation. The feedback period is usually three to four weeks. Following consultation, further revisions are made to the design to take into account public responses, and technical and safety advice. It’s a balancing act – and not everyone will get exactly what they want. The revised design is then taken back to the IT&E Committee and Council for approval before undergoing detailed design. We’re not finished yet. We need an independent post-construction safety audit to check if the newly built street is functioning well or we need to make further changes. 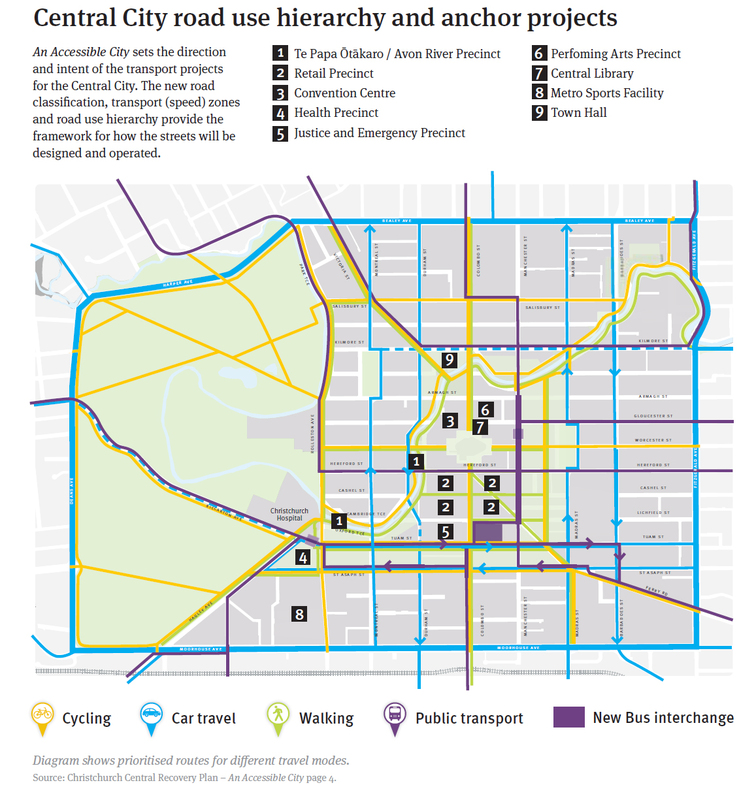 The Council is working on transport projects that look at changes to travel in the central city as outlined in the Christchurch Central Recovery Plan’s(external link) transport chapter – An Accessible City. The Recovery Plan(external link) was developed under the Canterbury Earthquake Recovery Act 2011. This was published by the Canterbury Earthquake Recovery Authority (CERA) in October 2013 following consultation in late 2012 and early 2013. However, people initially shared their ideas and viewpoints about travel in the central city through the Council’s 2011 Share an Idea campaign and this feedback was considered as well. An Accessible City sets the direction and intent of the central city transport projects to meet the needs of people and businesses. The new road classification, speed zones and road user hierarchy(external link) each contribute to the framework for how the central city’s streets will be designed and operated. An Accessible City also underpins the Recovery Plan(external link) – delivering a travel network that enables all of the anchor projects and the new developments across the city to function and be easily accessed. It is part of the $72 million cost sharing agreement(external link) with the Crown, the Council and New Zealand Transport Agency and is in partnership with Environment Canterbury and Te Runanga o Ngāi Tahu. In November 2012 a draft An Accessible City chapter was released for public consultation, with 278 submissions received. These were collated and summarised for the Minister. Released on 31 October 2013, the final An Accessible City is now the transport chapter of the Recovery Plan(external link). It was developed by CERA collaborating with the Christchurch City Council, Environment Canterbury and the NZ Transport Agency, and it incorporates feedback from the public consultation process. Visit Have your say(external link) to find out more.